In the days of yore, expectant fathers waited patiently in the hospital waiting room to be handed a tightly bundled boy or girl. What a difference from the daddies of today! These guys expect to be involved from the moment the pregnancy test strip turns pink. They rest their hands on their wife’s pregnant belly, waiting for the first sign of movement; they interrogate the obstetrician and get choked up while watching their future son or daughter wriggling on the ultrasound screen. Fathers want to be involved in their wives’ pregnancy, so much so that they often feel left out of the baby-making process. Does this sound familiar? Are you a dad who is feeling marginalized and wants to be more connected to your future child? Reading to an expected baby is a wonderful way for a father to feel a part of the miraculous experience of creating a new life. Dave, the father of amazing baby Lucas (see our May 12 post, “Proof in the puddin’”), says that he would strongly encourage any mother and father to read to their unborn child as much as possible. “I felt the urge to read more than my wife,” he says, “because I knew my unborn child heard my wife’s voice all the time even when she wasn’t reading to him.” So Dave frequently read to his son in the womb and felt that the experience contributed to the strong bond and closeness that they share today. 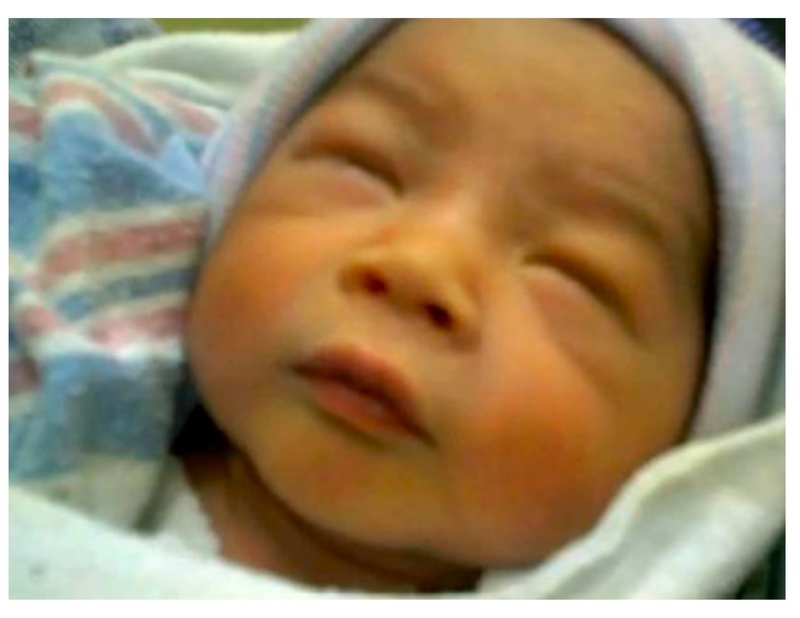 Even as a newborn, Lucas would brighten up at the sound of his daddy’s familiar voice. How does a dad begin? First he should designate a special and regular time each day to snuggle up to his expectant partner and her belly. (Make sure to ask her first!) Choose a story that is rhythmic and repetitive; the research says that babies respond best to stories with an inherent beat. Read the same story or poem each time and we promise that your unique daddy voice and the story will soon become familiar to your baby. Also, there is some evidence that it may help the acoustics if you keep your mouth right up close to the belly. Here’s another fun Shel Silverstein poem appropriate for a dad to read to his child. 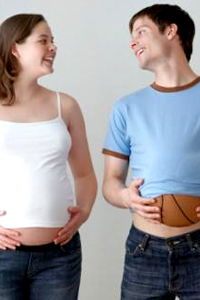 The rhyme and rhythm are for your baby; the humor in the poem is for you and your expectant partner. But any rhythmic story, poem, even song lyrics will do, as long as you read it regularly and repetitively. And two knobs saying VERT. and HORIZ. Reading to an unseen listener may feel odd at first, but you’ll find that sharing this special reading time with your partner and expected child will become a loving family routine, the cornerstone of family bonding for many years to come. And you won’t be alone. 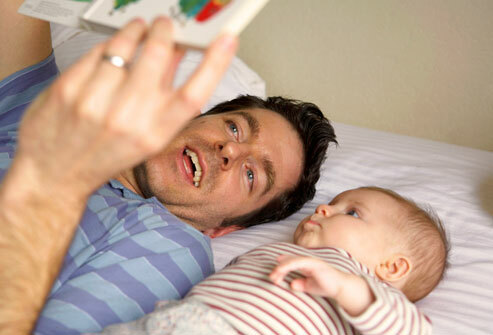 Many dads are jumping on the prenatal-reading bandwagon. New York City father Elvin Freytes received a great deal of publicity recently by starting his own movement for fathers to read to their children in utero. On Freytes’s popular blog MaJenDome, he states that his mission is “to inspire expectant fathers to read to the expectant mother’s womb. If an expectant father can commit to reading to his unborn child every night, he will have a special opportunity to bond with his child and establish a routine that can be continued once the child is born. This movement is about strengthening the parental involvement of fathers from the very beginning with the simple task of reading, which will later support the child’s social and intellectual development.” We couldn’t say it any better. So go ahead, Daddy. Read to your baby. When he is born and you say hello, he’ll be thinking, “Hey, I know you!” And when you share the story he’s heard so many times before, your little one will become an alert and attentive audience, captivated by his daddy’s voice, the voice that is yours and yours alone. Previous postThere ain’t nothin’ like the real thing, baby! Next postAh, that new-book smell! Great piece and thanks for the mention. Great post! All of my girls were read to from very young ages, and all 4 are voracious readers! You gave your girls the gift that keeps giving, the love of reading!